A Klee painting named "Angelus Novus" shows an angel looking fixedly contemplating. His eyes are staring, his mouth is open, his wings are spread. This is how one imagines the Angel of history. His face is turned toward the past . Where we perceive a chain of events, he sees one single catastrophe which keeps piling wreckage upon wreckage and hurls it in front of his feet. The Angel would like to stay, awaken the dead, and make whole what has been smashed. But a storm is blowing from Paradise; it has got caught in his wings with such violence that the Angel can no longer close them. This storm irresistibly propels him into the future to which his back is turned, while the pile of debris before him grows skyward. This storm is what we call progress. Walter Benjamin (1947) 9th Thesis on the philosophy of history, Harry Zohn (translated) in Hannah Arendt (edited) 1968 Illuminations. Schocken Books, New York, p12. 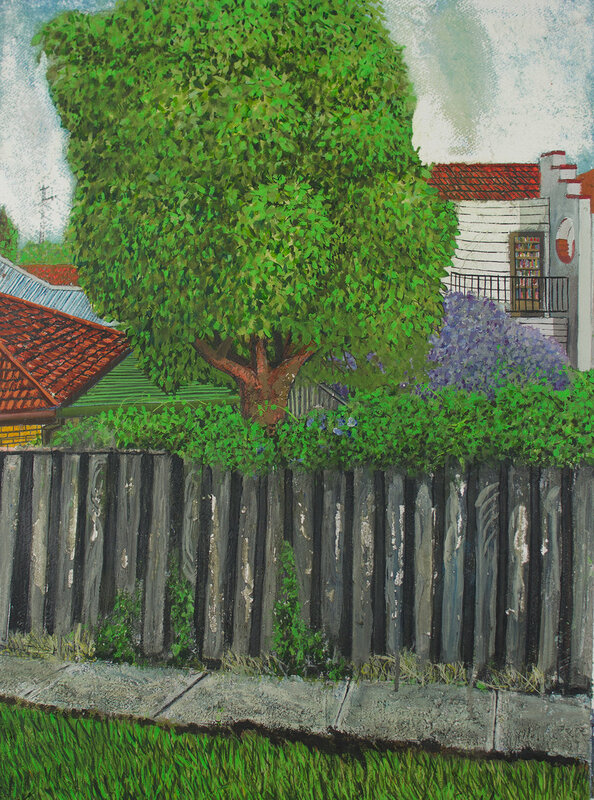 This show will be an imagining on belonging and country (amongst other things) in postcolonial Australia from a non-indigenous perspective, through Josh Wilson's painting of Thornbury and the psychogeography of his wanderings through the years and streets of the inner northern suburbs of Melbourne. "This is the country of the Wurundjeri and has been since time immemorial. They were murdered and driven from here, their country was stolen, degraded and transformed.They survive, but their dispossession continues, I am part of that dispossession . Since invasion the history of “Thornbury” has been short, bloody, dramatic, and full to the brim with nutters (radicals, bums, poets, artists, crooks, cooks, smarties and dullards) coming from around the world and home grown. The changes (in the last 150 odd years) to the landscape, plants and animals, are amongst the most radical, wonderful and horrific in all of human history." - Josh Wilson.